Preclinical models are poorly predictive and standard clinical study design are poorly semiologically relevant. Therefore first in patient study represent a unique opportunity to enrich preclinical data sets. It can inform clinical development until end of Phase III and suggest new therapeutic indications in patients with neuro-psychiatric disorders. The evaluation of new drugs in early stage development (0 to 2) is of major interest to patients who can take early advantage of a potentially effective therapeutic indication. Unlike late development stages (Phases 3 and 4), these early trials, with their capacity to generate high-quality scientific publications, allow the full span of research to be covered. The importance of the medico-social burden of diseases of the nervous system contrasts with the limits of the available therapeutic arsenal and the difficulties in the development of new therapeutic approaches. These failures are explained by a combination of phenomena linked to the limits of animal models, or methodological shortcomings of clinical trials. 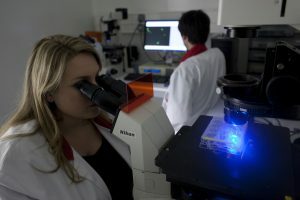 To meet the expectations of patients and patients’ associations and to allow our hospitals and our research organizations to benefit from the use first and foremost of innovations linked to a pharmacological tool, the goal of this structure is to create the first ever worldwide network to develop innovative methods to evaluate drugs in early stage of development. Recruit clinical and regulatory experts from the drug industry. Engage in a clinical research quality and accreditation approach. Support service in regulatory processes. Integration of preclinical platform resources to carry out «inverse translational» programs. Development and validation of new predictive tools based on multimodal analyses (imaging, biology, sharp clinical analysis…) and advance the integration of digital tools. Include patients from the earliest stages. Foster innovation and multidisciplinary cooperation to improve the efficacy and quality of therapeutic trials. WHY START AT THE ICM ? The goal of NeuroTrials is to structure nationally early clinical research in neurology and psychiatry, relying on an existing structure and already benefitting from a high level of international recognition. 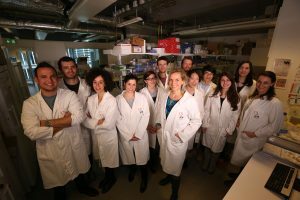 Of the 27 research teams (over 500 researchers and technicians), most of whom are specialized in clinical research, in healthy people and in patients, from neurodegenerative diseases (Alzheimer, Parkinson, ALS etc.) to epilepsy, but also multiple sclerosis, various neuro-genetic diseases etc. 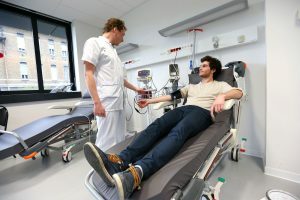 One floor (2500 m²) is dedicated exclusively to clinical research, including the CIC, as well as the presence of 10 caregivers, 3 technicians, many physicians and post-doc researchers, 17 places in hospital day care and 10 beds. The structure has particularly high-performance clinical exploration platforms, managed by 25 engineers: three 3 Tesla MRIs, a magneto-encephalography (306 channels), quantitative electroencephalography, trans-cortical magnetic stimulation, virtual reality, video-tracking, platform and tools to stimulate deep brain structures. NEW FINDINGS IN MYELIN-RELATED DISORDERS!